Espresso is beautifully complemented by creamy, smooth white chocolate to create an indulgent beverage perfect for a cold winter’s day. 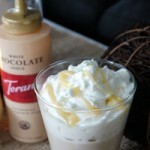 Combine milk and white chocolate sauce in a milk frother and heat according the frother’s instructions. Pour milk mixture into glass and add brewed espresso. I like to use a spoon to hold back the foam while I pour, and then top with the foamed milk. Add a little whipped cream and drizzle with more white chocolate sauce. Enjoy!